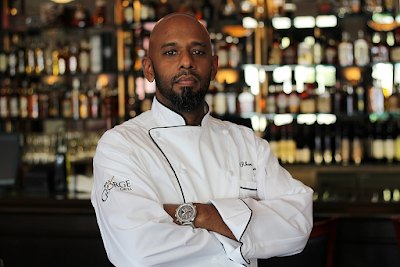 HilliardBruce Estate Wines In The Sta. Rita Hills Of California Make A Big Impression . Recently we stopped in to the sprawling, picturesque HilliardBruce Estate located between Lompoc and Bueleton California along Hwy 246 in the Sta Rita Hills to check out the latest vintages of this very boutique producer. We have watched this producer literally from the very beginning. Starting in 2004 John Hilliard and Christine Bruce planted 21 Acres of Vineyards on their 101 Acre estate that is also home to rolling green pastures for their Arabian Horses. Their wine is made 100% from their SIP Certified estate vineyards of Pinot noir and Chardonnay. We decided to get down to the terroir of the vineyard and take a closer look at what produces this amazing Chardonnay and Pinot Noir. 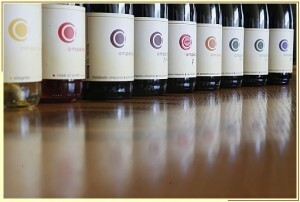 There is 17.5 acres planted of Pinot Noir consisting of clones Calera, Pommard, 115, 667, 777, and 828. The Chardonnay planted consists of approx 3.5 acres and clones 76 and 96. Both varietals combine for an average of 2,420 vines per acre. Keeping with their sustainability practices, the property is solar powered by 35 Kilowatts of solar panels. Water is from a six acre foot reservoir and compost is made on site. We entered the vast tasting room of the estate with unimaginable views of regal Arabian horses in pristine pastures surrounded by the Vineyards of this state of the art Estate. 2010 Hilliard Bruce Vineyards Chardonnay Santa Rita Hills. Straight from the 3.4 acre Estate Chardonnay vineyard, our very first impression that came to mind is white burgundy. 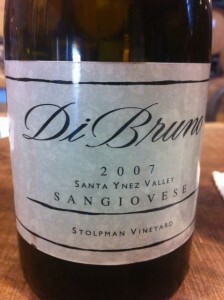 In the glass this straw colored, medium bodied wine led us to a very complex nose of mineral, slate and citrus. 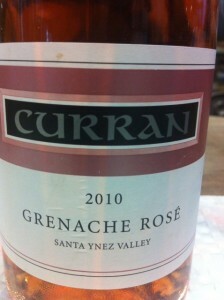 On the Palate, mineral, grapefruit and some earth notes combine for a long elegant finish. This very lovely Chardonnay is aged 100% French oak, 30% new, barrel fermented with Montrachet yeast, full malolactic fermentation and aged on the lees for 16 months with battonage techniques. With only 175 cases produced, this Chardonnay is a must for your cellar and drinkable any time of year. We were interested to take a look at the 2010 Vintage of the SUN Pinot Noir even though it is younger than we usually would taste. In the glass, the classic burgundy color sparked in the afternoon sun with this medium bodied Pinot Noir. On the nose, expected aromas of Cherry and spice combine with the signature light smoke of the Sta Rita Hills terroir. On the palate , intense Cherry , Red Fruit and spice jump out with crisp , bright flavors and linger for a long finish and soft mouth feel that was impressive for a young wine. Aged in 100% French oak barrels, 50% new and aged on the lees 16 months. This lovely Pinot Noir has a 600 case production and from what we tasted in the 2010 Vintage will be even more of a star as it progresses in age. This Pinot Noir from their Moon Vineyard is truly special. Each vine only bears 1.5 pounds of fruit and the clusters are so small they can fit in closed fist. Now that’s what we call intense! In the glass this Pinot Noir showed deep burgundy color giving way to a deep red rose color near the glass rim and medium bodied. 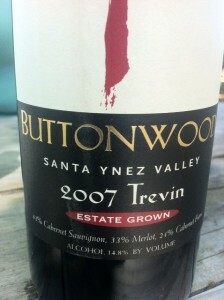 On the nose, dark red fruit, red flowers, cherry and spice are predominant. On the Palate, elegant red cherry, all-spice, light smoke and earth notes show off a very classic Pinot Noir and a signature of the Sta. 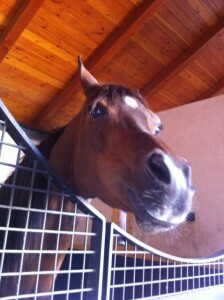 Rita Hills. It is well known that Pinot Noir more than most varietals shows its sense of place. Aged in 100% French oak barrels, 50% new, aged on the lees 16 months , The 2010 HilliardBruce Moon Pinot Noir with only 195 cases produced shows classic Pinot Noir notes with its signature sense of place in the Sta Rita Hills on the HilliardBruce Estate. 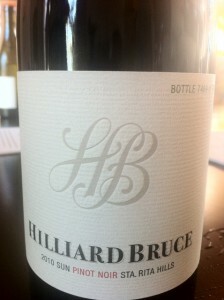 It is hard to realize that the HilliardBruce Estate Vineyards were only planted in 2004 with the quality of wines being produced over the last 3-4 years. 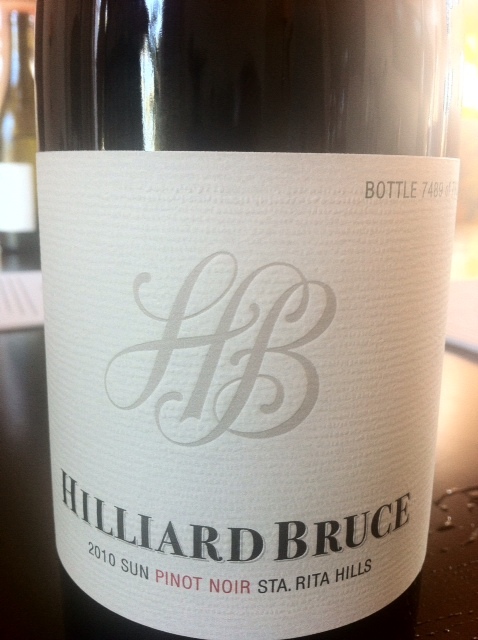 HilliardBruce Estate wines have been getting a lot of attention and highly rated and we can see why. It is said that one of the most defining aspects of a grape varietal is its sense of place. It has a signature that many times makes it unique and unmistakable. Even Journalists that share their experiences with their ever eager readers have a sense of place, a place that brings memoires screaming to the forefront of the consciousness, a place where it all began for them. Recently we returned to our sense of place, to the familiar smells, the wines, the food and the people that gave us our own signature and unique sense of place. The lovely Santa Rita Hills and the Santa Ynez Valley in California’s Santa Barbara County is the place where it all began for us and sent us on an incredible journey and a new career. 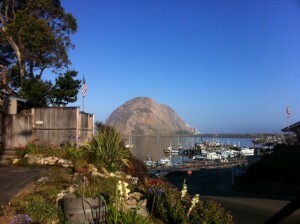 The quaint coastal town of Morro Bay was the trailhead of our journey south back to our roots. As the familiar morning Fog was beginning to reveal the Historic Morro Rock, we headed out with a few stops planned as we continued our journey down the Hwy 101. 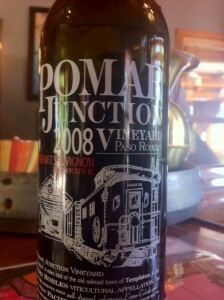 We turned east toward Templeton away from the coast for a stop in to Pomar Junction Vineyard and Winery. The very scenic 30 minute drive took us through fertile farm land and vineyards as the warmth of the Sun broke through to start a cloudless day. Turning on El Pomar Road, the Vineyards of Pomar Junction came into view. 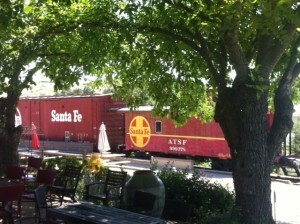 Their Historic Railroad Box Cars signaled the entrance to their tasting room and we had arrived at our first stop. Having heard we were in the area, Owner Dana Merrill and Winemaker Jim Shumate met us is the tasting room to show us around. And show us around they did! After tasting through their wonderful sustainable wines, Dana took us for a tour of his Vineyard and ended up at the Winery where Jim Shumate gave a preview of upcoming vintages with a barrel tasting. 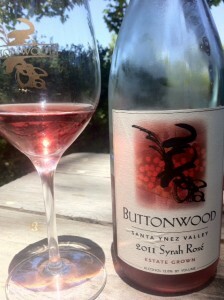 Back up to the tasting room, lunch and a lovely bottle of Pomar Junction Syrah Rose 2011 on the patio overlooking the vineyard was the perfect way to start the afternoon. Back on to Hwy 101 south with the Pacific Ocean over our right shoulder we had yet another stop. This time we were meeting up with fellow journalists for some lunch and bubbles at Laetitia Winery. There is probably not a much prettier drive than HWY 101 from Morro Bay South, accented by the rolling farm land adjacent to the sparkling Pacific Ocean. Arriving at the tasting room we met up with our journalistic colleagues, tasted through some very elegant Sustainable wines and then had lunch under the trees as we shared stories and enjoyed Laetitia Brut de Blanc , Brut Rose and Brut Cuvee Sparking wines . After saying our goodbyes, it was now time for us to continue south on HWY 101 onto our next stop, our sense of place! A short drive south on Hwy 101 brought us to Lompoc and Hwy 246. It has been almost two years and now we were home! The Santa Rita Hills always feels like home to us because this is where it all started, right here driving down Hwy 246 memories evoke goose bumps. In this area the Vineyard owners and Winemakers are still “farmers”, they walk the vineyards, many still hand sort Syrah, Pinot noir and Chardonnay and they have opened their homes to us for many years. We have long-term relationships and good friends in this area and some new friends as well. On this visit, John Hilliard and Christine Bruce owners of HilliardBruce Vineyards graciously opened their 100 acre Estate to us as our “base of operations “for the next few days. Driving into their estate was like driving into a movie. The gates opened like entering the emerald city itself. 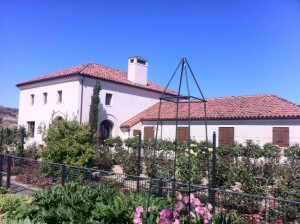 After being introduced to their Arabian Horses we took a stroll through the garden, pastures and vineyards as we sipped on HilliardBruce Sun Pinot Noir Sta Rita Hills 2010. We watched the setting sun behind the Sta.Rita Hills and the Pinot Noir vines while the “seasmoke” settled on to the vineyard. The Lompoc wine Ghetto is relatively new and home to many of the area’s finest wineries all in one place. On this occasion we had to stop in for a visit with the Legendary Kathy Joseph at her Fiddlehead Cellars tasting room right in the middle of the action. 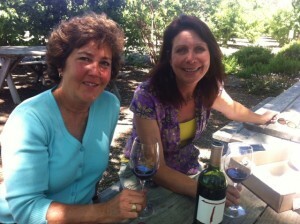 Kathy is a true legend and one of our mentors who influenced us greatly and educated us on the art of winemaking. We sampled her lovely wines and even her very special Lollapalooza Pinot Noir that is a legend in it self. 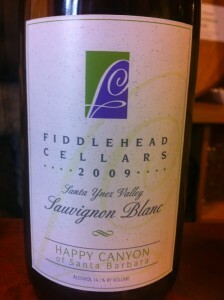 Of course, we had to take a bottle of the Fiddlehead Cellars Sauvignon Blanc to enjoy latter on! Next stop in the Ghetto was the Palmina Winery tasting room. Palmina is relatively unique to the area as they produce hand crafted Italian varietals. The lively, bubbly tasting room manager took us through their extensive wines from Arneis to some very bold, tasty Nebbiolos and then it was off to see yet another legend in nearby Santa Ynez. Heading south on 246 memories rush back into our minds like a freight train as we pass the La Purisma Mission and then the Vineyards of Clos Pepe , Babcock , Foley , Melville and then onto Buellton and its’ tasting rooms and of course, The Legendary Hitching Post Restaurant . The next town is the Danish inspired town of Solvang which is always worth a stop, but on this visit we had a lunch date to keep. Still on the Vineyard gauntlet of Hwy 246 we turn on to Alamo Pinto Rd and dropped in for lunch under the buttonwood trees at Buttonwood Farm and Winery with winemaker Karen Steinwachs. With the warm sun of the Santa Ynez valley breaking through the Buttonwood trees, Karen started us out with her lovely Sauvignon Blanc 2010 and of course the very famous Zingy 2011 and even a Grenache Blanc. Then it was on to her Syrah Rose, Merlot, Cabernet Sauvignon, Trevin 2007, Syrah and Grenache as the lunch progressed. It is always a pleasure to come home and find our sense of place under the Buttonwood trees with a legendary winemaker like Karen as she spoke about the wines and vineyards under the shade of that very special place. Heading back towards Lompoc, we drove down Hwy 246 stopping in briefly at a few wineries, enjoying the magnificent wines from the Sta Rita Hills and reconnecting with our sense of place. 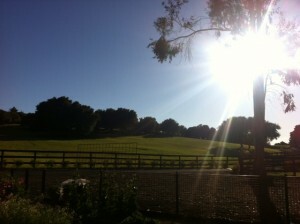 We returned to the lovely HilliardBruce Estate for a night of rest and relaxation. Feeling rejuvenated and refueled by a breakfast we made with fresh eggs right from the Estate, we prepared to embark on our last full day at “home”. Hyw 246 beckoned us once again to bring on our exploration of our roots, but this time we turn on Santa Rosa Road, a route that travels through some of the oldest and renowned vineyards in the area. 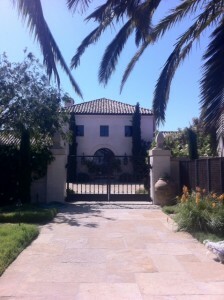 Santa Rosa Road is much different from the other areas in the Sta Rita Hills. Surrounded by the hills we actually descend into a valley dotted with Orchards, Vineyards and Wineries. The Vineyards of Sanford, Lafond , Fiddlehead , Alma Rosa and more are all located on this unique section of the appellation. On this day we joined some old friends and mentors Bruno D’Alfonso and Kris Curran who have a combined 50 years of experience making unarguably some of the best wines in the region. 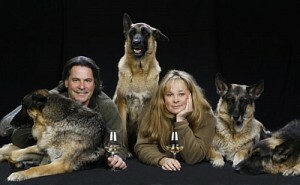 Bruno D’Alfonso ,Kris Curran and "The Pack "
In addition to having a love for making wines, these two legends have an immense love for their German Shepherds that are always at their side. Barking, they announced our arrival. We walked in to the winery and it was hugs all around for it has been such a long time sense we had last visited. Kris and Bruno took us though an amazing array of what they produce starting with Curran Grenache Blanc then a very nice Curran Grenache Rosé that is perfect for the summer months. Of course the Badge Pinot Noir was a must an then it was on to their Curran Sangiovese, Curran Tempranillo and Syrah just to name a few . With us by her side, Kris gave us a preview of upcoming vintages straight from the tanks that in a word were “works of art “. It would be very easy for winemakers like Kris and Bruno to “ rest on their laurels “ , but because they are who they are , they are constantly innovating and staying on the cutting edge of the industry and have many new projects in the works. Just to be around winemakers of this caliber who are also considered friends is truly an honor. 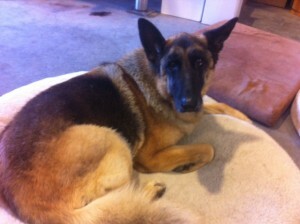 Kris and Bruno are a part of what give us our sense of place when we travel down Santa Rosa Road. Saying goodbye is always hard so we just departed with a hug and see you later as “the pack” escorted us to our car. It’s always tough to depart such great people but we still had a two more stops on this cloudless day in the Sta Rita Hills. 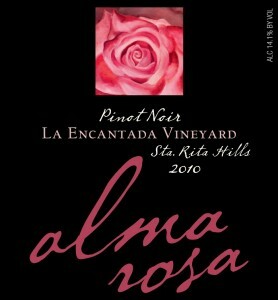 We continued on Santa Rosa road and we just had to stop in for a visit to Alma Rosa winery. We entered the tasting room and were greeting by a very nice and knowledgeable tasting room manager. We started right off with the Santa Barbara County Chardonnay and then on to what Alma Rosa is famous for, Vineyard select Pinot Noir and the man who was literally the first to Plant Pinot Noir in the area over 40 years ago, Richard Sanford. Sipping on a La Encantada Vineyard Pinot Noir evoked why we enjoy Pinot Noir from this area. The Sta Rita Hills pust its sense of place on its Pinot Noir and on us as well . We had interviewed Richard Sanford a few years ago and he had heard that we were in the tasting room. We turned and there he was, a true living legend. Richard, always pleasant and welcoming, joined us as we tasted through his amazing Pinot Noir from some of the finest vineyards in the country. After speaking with Richard and assuring him we would not wait two years before returning, we departed, bottles of Pinot Noir in hand, back down Santa Rosa Road for one last very important visit with people and friends who literally gave us our start. Many successful people can point to one period in time or a person that has left an inspirational impression, giving credit for a moment that changed their life or direction that created a foundation of for one’s life work or path. For us there is no question on where we got our inspiration and foundation and our gratitude is on-going for Wine Makers Peter and Rebecca Work of Ampelos Cellars in Lompoc. It was with the Works that we first walked the vineyards while sipping their signature Viognier . This was the place that we first touched the terroir that produces some of the world’s best Pinot Noir. It was with these two amazing people, we engaged in helping with harvest, crush and the physical labor of “cap” punch downs. We were side by side with them as we measured temperature and sugar levels in the fermentation bins. 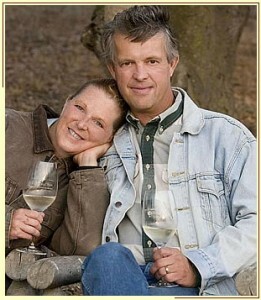 It was from them that we took our first steps into the world of wine and a career that we could never have imagined. Back on our old friend Hyw 246 and into Lompoc we turned in to a very familiar place for us, a place where we have spent time with good friends, mentors and even worked, The Ampelos cellars winery. The first to meet us right at our car was Peter Work and joined shortly afterward by Rebecca. It was so great to see our friends and mentors after two years. They have a great story themselves! Peter started the tasting with their very lovely Rose of Syrah and then moved into Pinot Noir and Syrah. 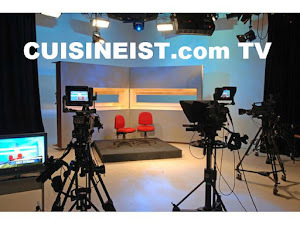 He told us of his wine successes and new projects that they are now working on. 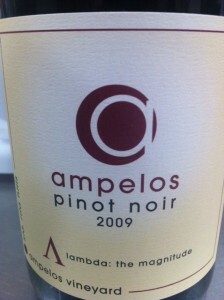 Ampelos wines are very unique as they are not only sustainable and organic but also Biodynamic . They were one of the very first wineries to achieve all three certifications including the coveted SIP certification (Sustainability In Practice). Barrel tasting is always a must when we visit and THAT we did as we roamed up and down the rows of Barrels stopping to sample Syrah, Pinot Noir and Grenache. Each barrel sample showed off what is to come in future years as they age. 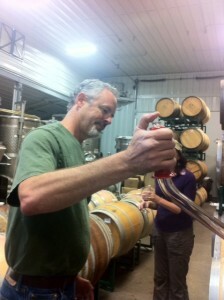 It was all about reconnecting in the winery and getting reacquainted with the great wines of Ampelos Cellars. As we said our good byes we planned our next visit (which will only be in a few months ) in order to spend more time with our good friends . Upon leaving the winery there is always a huge mix of emotion as we once again headed back on Hwy 246 and then onto 101 south. The Pacific Ocean gleamed as we sped along the highway, heading home, but once again, with a sense of place in our heart for the wines, vineyards, and friends of this very special part of the world.